German parent company — to GKN Aerospace Filton to rough-machine titanium aircraft components. Six years ago, there was a possibility of the Integrated Machining Facility (IMF) at Filton also being contracted to finish-machine these components; and while that work has not materialised, a large five-axis machining centre (from a different supplier) had to be installed at the outset to allow both roughing and finishing operations to be completed. During 2017, the customer doubled the number of parts to be manufactured, mirroring a similar increase in 2016. 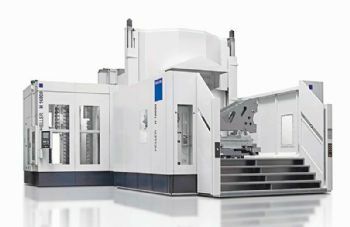 A second machining centre was therefore needed to cope with demand, but as the contract remains for roughing only — leaving a 3mm stock allowance to a tolerance of ±0.127mm over the entire surface of each part — a more cost-effective four-axis CNC machine was deemed sufficient for the task. Six potential HMC suppliers were considered, half of which were shortlisted. John Hendry (project improvement engineer) and Mike Davis (engineering group leader) opted for a Heller H 16000 with a high-torque spindle from Redditch-based Heller Machine Tools Ltd (www.heller.biz). Despite the machine’s size and rigidity, having an installed weight of less than 50 tonnes allowed it to be positioned in the Filton facility (where there is a 300mm-thick floor) without the need for any special foundations. Mr Hendry said: “The Heller machine was the best-value solution for us at the quality end of the market. 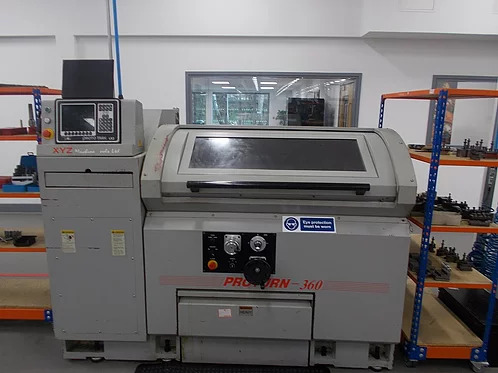 “We were also reassured that the German-owned company has a manufacturing presence in the UK, where smaller versions of these four-axis machines are produced. “This means that there is a strong engineering capability nearby, if it is ever needed. Mark Edwards, who is operations group leader of the Hard Metal Cell within the IMF, took advantage of the H 16000’s installation to re-engineer all five titanium aircraft parts; none of these requires simultaneous milling in more than three CNC axes, so he was able to achieve significant cycle time savings on the four-axis machine compared with the five-axis process routes. New strategies include taking lighter but faster cuts with solid-carbide mills and reducing the number of insert-type tools. Mr Edwards says that this assists the penetration of 60-bar coolant to the point of cutting, increases the metal removal rate, improves the surface finish by reducing the chatter from interrupted cutting, and prolongs tool life. For the largest of the five structural components, which is 2,400mm long x 200mm wide x 170mm high, the cycle time was cut from 70hr (in two operations) to 52hr — a saving of more than a quarter. Similar reductions have been achieved on all of the parts, the smallest of which still involves 14hr of machining. As an indication of the amount of metal removal involved, a 1.1m-long mid-size component that starts as a 176kg titanium forging ends up weighing just 67kg after machining. The specification of the H 16000 at Filton includes axis travels of 2,400 x 1,600 x 1,600mm and a 60kW 6,000rev/min high-torque HSK-100A spindle (2,292Nm). This machine is also one of very few such models built by Heller that offers the option of not having an automatic pallet changer (APC). The rationale is that if one had been integrated, the longest structural aircraft part — unless tilted — could not have been rotated in the fourth axis without interference with the guarding. That said, little time is lost during component change-over, as extensive use is made of zero-point clamping on the fixture plates. Other advantages of a non-APC arrangement are a smaller footprint and a door that opens wider, providing easier access for loading and unloading parts. In conclusion, Mr Davis said: “We already had experience of Heller’s equipment and service, as one of the company’s HF 3500 trunnion-type five-axis HMCs has been in use here since the end of 2016, machining titanium parts in our additive-manufacturing R&D department.